The GARR Network and its services are dedicated to the Italian Research and Education Community. Currently, around 1200 sites, including research and documentation centers, universities, observatories, laboratories, libraries, museums and other infrastructures, for a total of over 4,000,000 end users, are connected to the GARR Network. Thanks to the collaboration of the APM (Access Port Manager) of all the sites connected to the network, it is possible to make available to users who work in the various institutions the services provided by GARR. 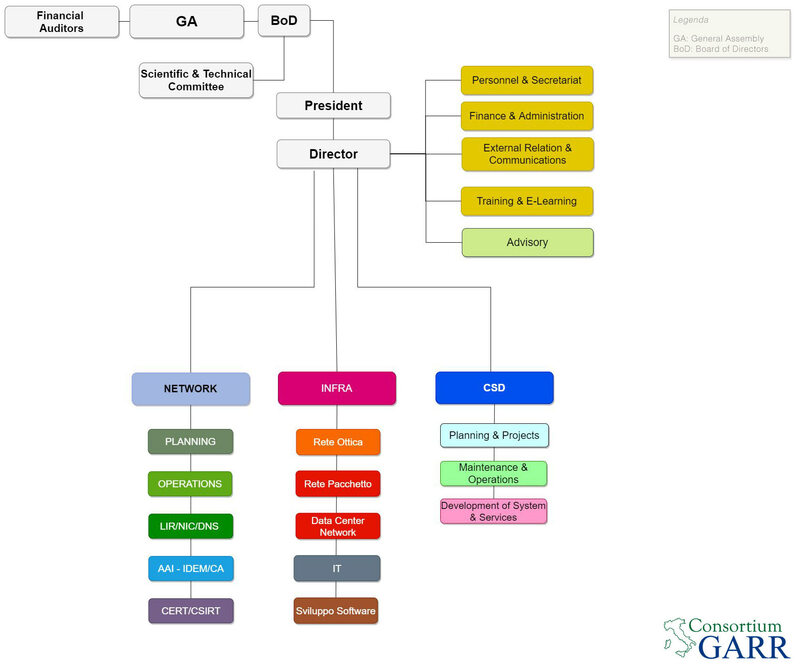 Below is a list of the structures connected to the GARR Network. List of connected sites classified by type of Body. Select a category to view the list of each site. Use of the connection by users requires the acceptance of the "Terms of Service". Visitors and guests at the Consortium GARR headquarters can access the internet using the eduroam or IDEM credentials provided by their membership body. If you do not have eduroam or IDEM credentials, you can use a dedicated wireless network using temporary credentials provided by GARR Secretariat. eduroam® (education roaming) is the service that provides secure wireless access to community and mobility users in Europe and beyond. GARR participates in eduroam as an Identity Provider and as a Resource Provider. You can use the eduroam service with any wireless-enabled device using the 802.1X protocol. To simplify the configuration of your device and make it compatible with eduroam connections, it is recommended that you use the installers provided by the CAT service at https://cat.eduroam.org managed by GÉANT.